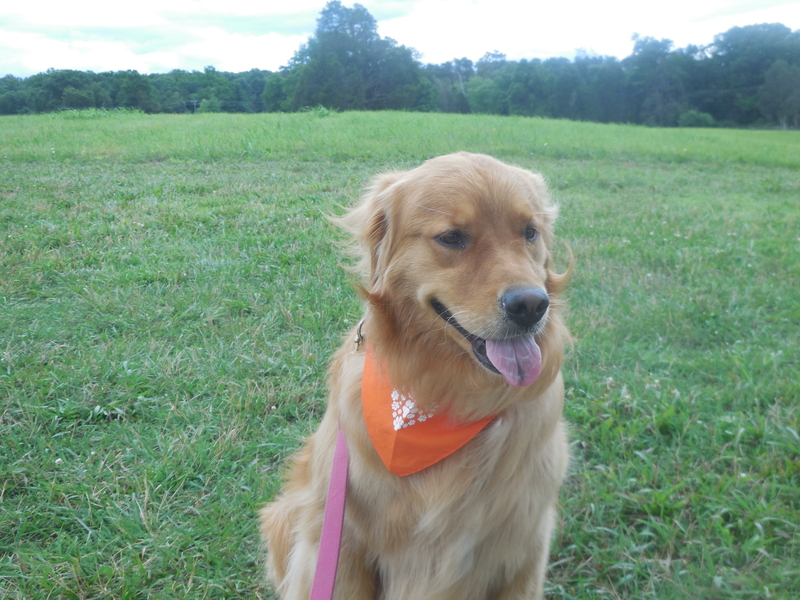 Mercy at Manassas National Battlefield for the Unite to Fight Pet Cancer Virtual Walk. I had organized a walkathon that was a subset of the Unite to Fight Pet Cancer Virtual Walk. This was to raise funds for the Morris Animal Foundation Golden Retriever Lifetime Study. I created the event on FaceBook. One person signed up. When I got to Manassas Battlefield Park with Mercy and the rest of my family, where I was supposed to have the walk, I knew I had to go it alone. There were not any Golden Retriever Lifetime Supporters from the state of Virginia there. It was a wonderful walk, nonetheless. I got some fresh air and beautiful pictures. My son Joshua was really happy. I did get to talk to another family with a Collie dog and share with them about the study. I still chose to have a good time despite the lack of participation at my local event that was part of the overall nationwide Virtual walkathon. There were other subgroups of people with their Goldens in places like New York for instance. I was trying to organize something in the state of Virginia, but despite my announcements on different websites and spending money to advertise on FaceBook, I got hardly any response. I thank those who helped me with setting up my event and those who donated including Leigh Collins and Kris Campesi. The lack of connections is a discouragement, but I don’t let it slow me down. I was happy to raise funds for the Golden Retriever Lifetime Study. This entry was posted in Acceptance, Alone, Aloneness, Being Liked, Belonging, Connections, Friends, God's Grace, Going at it alone, Golden Retriever Lifetime Study, Golden Retrievers, Groups, Identity, Importance, Important Endeavors, Inclusion, Leadership, Loneliness, Meaningful Purpose, Outcast, Popularity, Rejection, Team Manassas, Teams, Teamwork, Value, Worth, Worthwhile Endeavors and tagged Advocacy, Allies, Belongingness, Canine Cancer, Connections, Dogs, Golden Retriever Lifetime Study, GRLS Team Manassas, Identity, Important, Manassas National Battlefield, Meaningful, Rejection. Bookmark the permalink.